History of Dera Natung Govt. College. Dera Natung Government College was established at Itanagar on 6th day of September 1979 with its erstwhile name ‘Government College, Itanagar’ with an objective of imparting higher education to young and inquisitive men and women of the state at a point of time when the opportunity was scarce in the locality. The founders had an ambitious endeavour not merely to make it a centre of offering Degrees but also to let the youths explore new areas of knowledge, providing a platform for budding leadership in all walks of life, preparing them for future challenges in personal and social spheres and grooming them as competent human resources who in turn could promote the high social ideals such as equality, social justice, communal harmony and cultural plurality. During its 36 years of glorious existence, the students, the faculty members, the non-teaching staff and the college authorities have been working towards these ideals and goals and presently it remains one of the premier institutes of Higher Education in the State with a legacy of excellence in teaching and learning process. 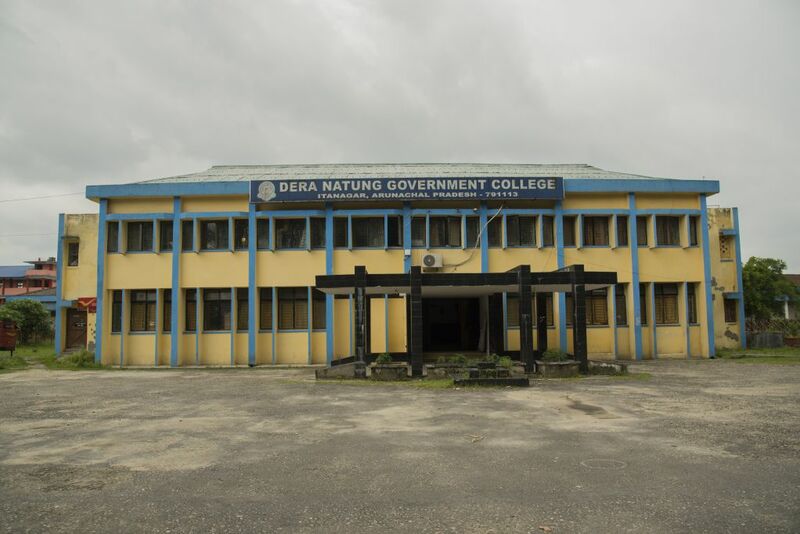 The college was re-named as DERA NATUNG GOVERNMENT COLLEGE in the session 2001- 02 to commemorate the voluminous contributions of the visionary and illustrious leader, late Dera Natung, who served as one of the most dynamic Education Ministers for all round development of education in the State. The college initially started in Govt Higher secondary School building Itanagar, and fulfilled the educational pursuits of a handful of students with four departments viz. English, Hindi, Economics and History in the evening shift. In 1986, it relocated to its present sprawling campus with a huge Administrative and Academic Block and continued both in the night and the day shifts till 1990 when the Night shift was finally done away with. Since then the college has made a splendid progress in terms of infrastructure, student strength, faculty position, encouraging student performance & academic research. The college has been re-accredited by NAAC with B Grade in 2012. Dera Natung Govt. College, Itanagar, the second institute of Higher Education in Arunachal Pradesh, initially housed in Government Higher Secondary school building, began its educational pursuits in the evening shift with four departments English, Hindi, Economics and History with a handful of students. Within a short span of time, the college made stupendous and splendid progress. It shifted to own massive building complex in its permanent site in 1986. Located Centrally in the Vivek Vihar sector of the State Capital Complex with a beautiful natural environment, surrounded on three sides by the river Ganga and on the fourth side by a hillock, it has an area more than 40 acres of land. Since its inception it has been imparting education in both Day and Night shift still 1990 when the night shift was finally abolished. The College has presently 3500 students including three streams of Arts, Science and Commerce. The college has a team of learned and dedicated teachers comprising of 13 departments. The college has a well-stocked library with about 31,094 titles and a Reading Hall. A big play ground with an open stadium developed under UGC fund provides ample facilities to students to nurture their skills in games and sports, athletic activities and other events for development of recreational and healthy environment in the campus. An Auditorium in the heart of the college facilitates the cultural, literary and indoor sports’ skills of the students besides the conduct of awareness programme, counselling, workshop, seminar etc. The college has a Computer Centre to train students in basics of computer education. UGC funded Coaching for Entry in Services Cell of the college imparts coaching to APST students to train and equip them for entry into various services. The coaching is held for four months every year on various competitive examinations with special focus on civil services and banking recruitment examinations. UGC funded Counselling Cell helps to generate awareness among the students regarding potential career opportunities. The counselling cell also imparts counselling regarding various employment prospects and higher studies. A UGC funded Remedial Coaching Cell takes care of the economically and educationally backward students in improving their standard. The college has well equipped NCC and NSS units which groom and guide students to imbibe spirit of discipline, unity, patriotism and social responsibilities. The cadets and volunteers serve the nation in various spheres with confidence. 0 Comment to "Dera Natung Govt. College Itanagar"